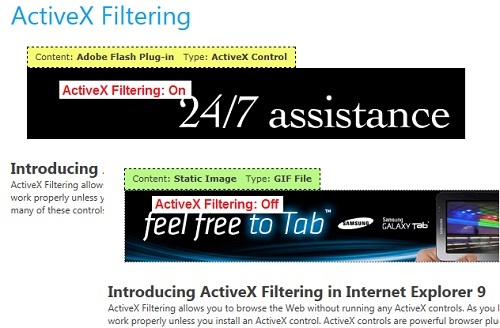 This section provides a tutorial example on how to enable the ActiveX Filtering function in Internet Explorer 10 to stop Adobe Flash Plug-in. 1. Turn off ActiveX Filtering by clicking Tools > Safety > ActiveX Filtering until it's unchecked. 3. Review the first ad banner. It is running an ActiveX control called Adobe Flash Plug-in, which plays multimedia animation. 4. Now turn on ActiveX Filtering by clicking Tools > Safety > ActiveX Filtering until it's checked. 5. Reload the page again by pressing Ctrl-R.
6. Review the first ad banner again. ActiveX control, Adobe Flash Plug-in, is not running any more. A GIF static image is displayed in the banner.